We liked the glowing parts, which gave the scene vibrancy even though it's such a dark weather condition. 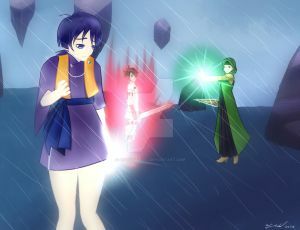 However, it is difficult to see Linaly as a part of the fight. Initially my friends thought she was just a (random) bystander. Furthermore, it is not really clear that there is even a fight going on--the two in the back looking at Linaly while she contemplates her actions seem like a summoning going on and they are asking her to join or something. We can see the effort you put in and we like the little details of raindrops on the characters, as well as the details of the rocks in the sky. Keep in mind that glowing parts reflect their lights (so the green glow would be visible on Tiz' sword as well and the red glow on Meliadoul). As you said yourself, the poses are still a bit stiff; experiment with some different poses. You can start small by spreading the legs a bit more or maybe arching the backs a bit. Whatever works best for you! This was the drawing that hit the brief the most! We liked that there were clear signs of the fight that had ensued. The only thing we would have liked to see more (to complete the brief execution score) was a clearer location. Though it is Besaid Island, it is very difficult to distinguish it as such so we had to check the description to really know where the characters were. The reason for our low score on artistic execution is that quite a few aspects of the drawing are not quite right yet. The most obvious is the tangent of the sword and the river. It looks like the water is flowing from the sword. The side of the cliff is vaguely cut off as well causing us to wonder what exactly is going on with the background. Other than that, Tifa's centre of gravity isn't quite where it should be, unless your intention was to make it seem like she was falling in which case it is not conveyed enough. Little stuff like that add up to the lowscore. However, your composition had a clear fore-, middle-, and background and we thought it was very creative to have the sword there! Keep tangents (lines that intersect and make it look like one thing stems from another unrelated thing) in mind. Try to keep the focus on the characters (it is more on the sword in this drawing). We liked the little game aspect of the popup saying which ability is being used. However, the proportions of the characters are off and it almost looks like Meliadoul is holding up Linaly in her hand (tangent). The background is also not very clear. However, we did like the tension between the characters. Try to work a little on your proportions; some hands are too big while others are too small in this drawing. Keep tangents in mind (like Linaly and Meliadoul's hand) and try to avoid them. We liked how it looks like the chocobo has just been summoned to attack Meliadoul. However, the background is not quite clear; who is standing where? Are Tiz and Linaly on clouds? Another thing we found was that the chocobo really draws attention to itself (and a little to Meliadoul), rather than the whole of the picture. Nevertheless, we did think Meliadoul's battle-ready posture showed the urgency it should convey. Though not putting the emphasis on background characters could be a good thing in any other picture, in this case they are key actors! Try to keep them from fading away in the background. The characters show a clear fore-, middle- and background, but the actual surroundings don't quite yet. Try to give the background the same attention. I hope these comments help! And I will try to get the final assignment up on Sunday! yeah Tifa was meant to be falling. I haven't experienced that before or since, so hopefully it was a one off thing! Oh, that's good :D Fingers crossed! I put the comments and tips because we thought that they were helpful, but you are totally free to ignore them if you feel they don't apply ^^ I do want to point out that we all understood there was a size difference because of perspective, but we felt that even in perspective it's still off. If you'd like to look up some tutorials or something about foreshortening after all, there's a very good video on how to do so by Sycra (www.youtube.com/watch?v=eJWLaD…).